The Spring Racing Carnival begins this month in Melbourne and the shops are full of fabulous frocks and accessories. Even if you don’t have an invitation to The Birdcage, there are lots of other events in Spring for which you may need a new frock or a new pair of shoes or accessories to freshen up what you already have. 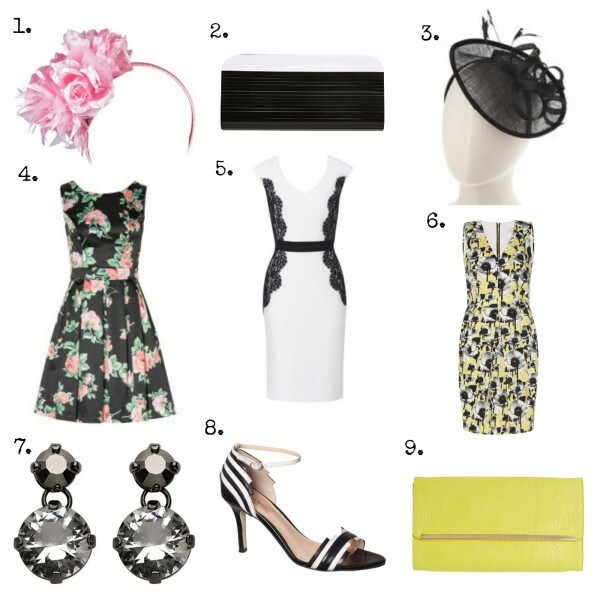 In my collage below, I have chosen three dresses that could be worn to the Races (remembering black and white for Derby Day), a wedding, engagement party or a work Christmas function. I have included black in all the outfits so they can work back with black shoes you might already have and so they are more likely to make the transition to an evening function. You will see that I have included less expensive fascinators and clutches and opted for more expensive dresses, as dresses are generally a better investment over the long run, particularly if you have other special occasions coming up or you can eventually integrate them into your work wardrobe. Fascinators – The department stores (David Jones and Myer) have a great range of fascinators, at various price points. This pink fascinator (1) is $49.95 from Myer. David Jones have a fantastic range colour-wise (I bought a gorgeous orange and pink fascinator recently; last year I bought a lemon one) but is at the upper end, price wise. Other retailers that stock lovely but less expensive fascinators include Diva and Target. The black fascinator above (3) is from Diva for $29.99. I wore this to a recent Spring Racing themed event and it looked great with a simple black and white dress. Other places to look include Alannah Hill and Witchery as they also stock fascinators and floral head bands. If you are crafty, you might like to make your own fascinator. Lincraft and Spotlight have useful tips and supplies. Clutch – A matching clutch can complete an outfit. Ideally, a great clutch will have enough room for your lipstick, phone and keys. This Academy Noir black and white hard clutch (2) is on sale at Mimco at the moment for $59. For a fashionable, on trend pop of colour, try this Penelope clutch in yellow (9) from Portmans at $29.95. Other retailers that stock clutches include Tilkah and Kate Hill. Dress – The dress on the far left (4) is the Lavinia Dress from Review. It’s flattering shape and modern floral print make it a versatile option. It is currently on sale for $129. I love white dresses even though they are not always the most practical or flattering on me. However, this Roxy Pencil dress from Diana Ferrari (5) counters this with the black lace print creating a narrower silhouette and the waisted belt creating an hourglass shape. It is also on sale for $139.95. Finally, on the far left (6) is the Poppy Print Dress from Veronika Maine. I can always find a great outfit at Veronika Maine. The neon yellow with the black and white is very on trend and the floral print is very “Spring”. The yellow Portmans clutch (9) would look great with this dress. At $259 this is not an inexpensive dress, however, worn with a cropped black jacket, it could also be incorporated into the work wardrobe down the track. 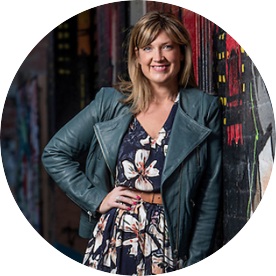 Other places that sell great dresses include Portmans, Alannah Hill and Cue. Earrings – A great pair of earrings or a cuff can be the perfect finishing touch to a race day outfit. These Double Crystal Drop Earrings are $34.95 from Witchery. You can also find great on trend costume jewellery from Sportsgirl and Diva. Shoes – A great pair of shoes like these Roxanne heels (8) from can lift a basic black shift (already in your wardrobe) to new heights. They are $139.99 from Diana Ferrari. Add a great clutch, like the Mimco clutch (2) and you have a complete outfit. If you know you are likely to spend most of your race day standing, perhaps opt for a lower heel or a wedge instead. Finally, there are a number of retailers that have created Spring Racing collections such as Review and David Lawrence. A quick walk around your local department store’s women’s clothing and accessories sections should also provide inspiration. Are you off to the Races? Where do you find great Spring Racing fashion? Any tips for Racing rookies?